Gene and Mary are two of the hundreds of volunteers that allow the Food Bank to serve our neighbors. Over the last 16 years, they have been dedicating two days a week to alleviating hunger and giving back to the community. 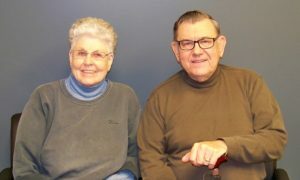 We are grateful for Gene and Mary, and many others like them who help by providing volunteer service, financial contributions and food donations. You make a difference and restore hope in the lives of families in need.